Taken at your leisure. Requires about 15-20 hours. The objective of this wholly online e-course is to introduce the participant to the concept of Corporate Social Responsibility and Sustainable Development today, operationalising the term and ensuring a cohesive definition of CSR and its applications to corporate sustainability. The learning materials and tools available through the courses allow participants to acquire the relevant introductory knowledge that will help them and their organizations to better address social responsibility concerns. The course is updated frequently to ensure latest information included e.g. much more on GRI and materiality than before. The latest update on Jan 1st 2016 includes the possibility of interactive sessions with other users – nearly 1000 satisfied users up to now (including especially adapted versions used by The World Bank and the United Nations). Check out this this introductory 9 minute video from the courses’s author Much more in the course …. of course! The course aims to address the needs of professionals in private companies, NGOs, International Organisations and Governments who are currently involved in CSR and Sustainable Development (CSR for short as our definition shows), or would like to be involved in CSR, and wish to make the concept of CSR applicable in their institution. We also felt the need for this self-paced course because there are so many definitions of CSR buzzing around that we thought it would be useful to provide a guide to them and, also, to suggest a definition we think most appropriate. 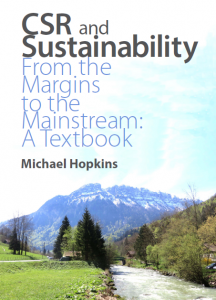 The main author of this course, Prof. Michael Hopkins, has been involved in CSR since the early 1990s and has developed, and steadily, modified a definition of CSR that many people now use. He uses his definition as the basis for his face-to-face courses around the world and his work with companies and Governments (www.mhcinternational.com), in his global CSR and Finance Training Institute (www.csrfi.com), and with George Mason University (GMU) in the USA (som.gmu.edu) where Michael is Adjunct Professor and the Founder and Director of their CSR courses. Michael is also CEO of MHC International Ltd (MHCi) and CEO of CSRFI. The course is aimed at CSR/Sustainability Executives in business, but is also useful for non-profits, small and medium sized business (SMEs) and international civil servants from the UN. Most examples are taken from business. Nonetheless, there is a section on SMEs and also one on NGOs. The UN and its work on CSR are also highlighted in detail during the course. For instance, the course shows how the UN Global Compact fits into the CSR approach as well as how UN agencies such as ILO and UNIDO have played a role. The course will require approximately 15-20 hours of time over the course of two weeks (although it can be done much quicker by avoiding the reference texts and some have finished earlier versions of the course in five hours!). 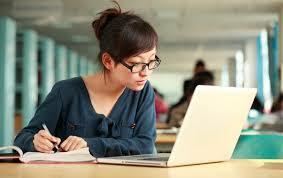 It will require reading a number of articles as well as watching videos and presentation of case studies. By the end of this 15-20 hour course, the student will be able to find out what CSR and Sustainability are all about; to explain alternative definitions of CSR and their strengths and limitations; and to understand why there is a need for CSR. There is an end-of-course quiz intended to help the student self-assess his/her level of comprehension. A requirement is to get at least 80% of the questions within two tries at which point, should the student pass, he/she will automatically be awarded a certificate of completion from George Mason University’s School of Management. To distinguish between the applications of CSR in various practical situations. The ten question multiple-choice exam is presented at the end of the course to test your knowledge and award a George Mason University of Washington DC, USA Completion Certificate if you are successful (80% correct). You have two tries! 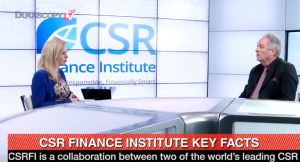 Why CSR and Where is CSR Today? This e-Learning course provides participants with (a) main reading materials; (b) additional reading materials; (c) bibliography of references; (d) glossary of terms; (e) external links to internet resources; (f) discussion forum; (g) one end-of-course quiz to test understanding and provide final grading. The course invites participants to read a number of articles, to watch videos, to reflect on their social and economic environment, and to go through case studies analysis that are provided throughout the course. By the end of the course, students will have a better understanding of the need for CSR/Sustainability and be able to explain alternative definitions, their strengths and limitations. The is an end-of-course quiz is intended to help participants self-assess their level of comprehension. The course aims to address the needs of professionals in private companies, NGOs, International Organisations and Governments who are currently involved in CSR/Sustainability, or would like to be involved in CSR, and wish to apply and embed the concept of CSR in their institution. The course has been used successfully by the World Bank, the United Nations (UNITAR), the University of Geneva as part of their CSR/Sustainability programmes. It has also been used by nearly 1000 people around the world and is upated regularly to take account of comments and suggestions (latest update Jan 1st 2015). Contact us for any questions or more information on enquiries@mhcinternational.com . “I like your online course, I think it is a good introduction to CSR and it is quite practical to navigate through. I like the fact that you have a quiz at the end” Rania, UNICEF. “I find it very informative and efficient in terms of return on effort. The introductory video is very good. It sets the tone of the course almost like in a “face-to-face” environment. I like the way to travel through the course, forwards and backwards. It is convenient. The idea of the forum is excellent as it promotes participation. Congratulations for the excellent course. I wish you plenty of the success with it.” Marc. Former Director, International Schools Geneva and Senior Executive Nestle, Switzerland. You may pay by any credit card (see next) or via Paypal (see Left Hand Column). Of course, it is always slightly worrying when you pay online, but please don’t worry..and see our refund policy below. You can buy online using the ‘BUY NOW’ buttons below or via your own Paypal account. On satisfactory completion of payment, we shall send you the course logon instructions. 2. Delivery Policy – After payment received we shall e-mail you the username and password for the e-online course within 72 hours. 3. Refund / Cancelation Policy – You may cancel at any time before starting the course i.e. entering the username and password, and we shall then cancel your username and password. 5. Contact us – best way to contact us is via e-mail on enquiries@mhcinternational.com. Our postal address is CSRFI/MHC International Ltd, 24 Chiswell St, London EC1Y 4YX, UK. 7. Monies received are transferred to our account held by HSBC in London and are fully declared, annually, by our London accountants to the UK tax authority (HMRC).